Elite Design designs and manufactures custom, high quality advertising and promotional refrigerator magnets, business cards magnets, magnet calendars, save the date magnets, custom ribbon magnets and other custom indoor or outdoor magnets. We can meet all your custom magnet needs, from promotional magnets and business magnets to car magnet signs and schedule magnets. Your business name and information will always be in front of your clients when you use our magnetic business cards. Custom Magnets are not just for business - Save the Date magnets are perfect for weddings, anniversaries and special events. Custom Ribbon Magnets are a great way to raise funds for your charity or organization. All of our high quality indoor and outdoor magnets come with free graphic design services and expertise to help you achieve your goals. Custom magnets can be created to your specifications. Custom magnets are printed on white flexible magnetized vinyl for durability and we offer digital printing or screen printed options. Ideal for service companies, schools, book stores, small businesses and more. Don't see a custom magnet product you need...contact us below and we can find what you need! 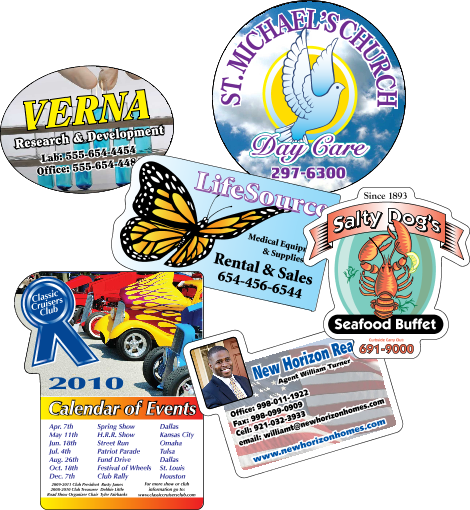 To request a quote on any of our custom magnets or magnetic products click here. Quantity discounts available.